Google Duplex Demo – Who needs humans to make calls for appointments anymore? Why are some weird Wikipedia pages completely deleted forever? Must Read:Finally, Google Home and Google Home Mini have come to India. The Fanciest Luxury Travel Experiences In India are here! The Most Popular Deep Dive Sites in the World for the adventure hungry! 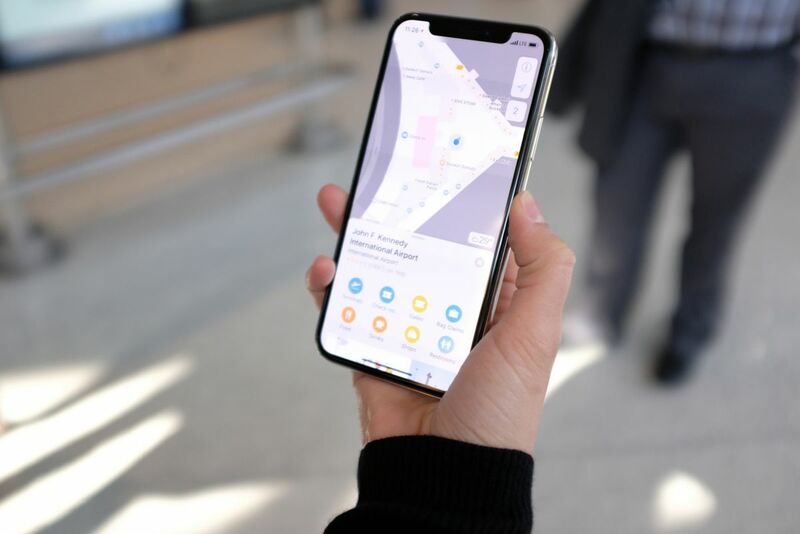 Apple Maps has now started mapping & including indoor layouts of 30 airports across the globe with the focus initially on bigger cities in the continental U.S. thus far. Some of the major international airports included in the list are Geneva, Amsterdam, Hong Kong International, two in London, Berlin and a few more in Canada. Looking at the level of detail, it seems like Apple has been working on this for quite some time as only close cooperation with the airports, in-person surveyors, and people recording all the data in-person without relying on the street mapping cars Apple and Google love to overuse is what gets you detail like this. 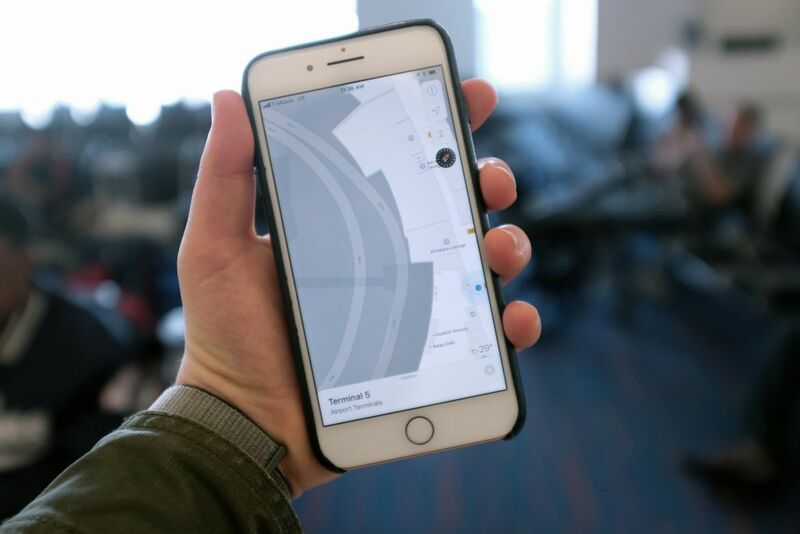 If an airport is present in the list, it will now have the “Look Inside” option on Apple maps. Clicking on that brings up a bird’s-eye view of the inside layout of the terminal. In the case of most airports, that’s about it. Unless you’re giving a street view-esque experience, a lot of the airport terminals aren’t much to look at. On the first grid view, each gate is highlighted in yellow and key points of interest like baggage, check-in counters, airport lounges, and security populate the map. Zooming in further reveals more POIs in detail, namely restrooms, restaurants, shops and more. 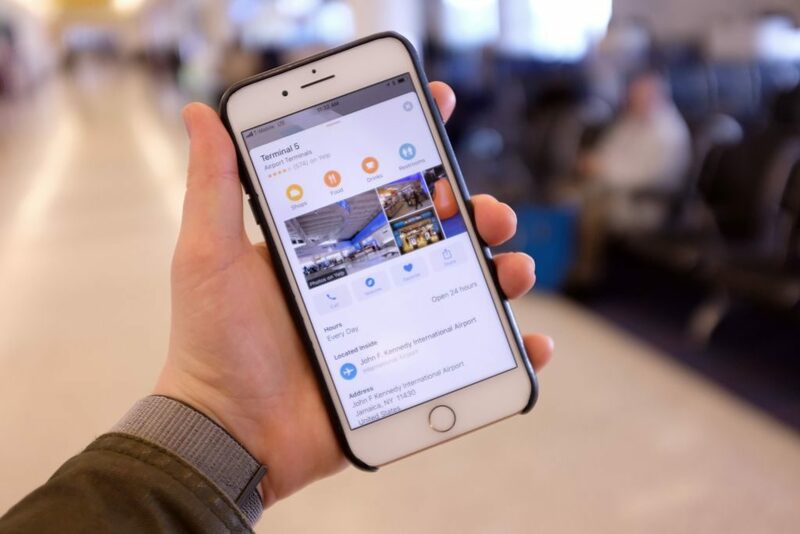 Tapping on a restaurant brings up a tab with information about the place just like a display panel outside the airport provides. The terminal name, floor number, phone, open hours and reviews from a third-party review platform (Yelp) are all displayed on this data tab. The upper-right corner number toggles between terminal levels. Swiping up with two fingers brings up a 3D view of the space including depth which gives wandering people a clear picture around the terminal. The system amazingly has an accuracy within a few meters of your location inside the terminals. Apple achieves this using Wi-Fi access points throughout the terminal for triangulation. Attention to detail is clearly seen with pinpoint accuracy! Bottom line, the ability to see which gate your flight is leaving from and finding out the exact carousel your luggage is on directly through Apple maps could prove to be extremely useful. You can find the full list of airports carrying the new feature here on Apple’s site. KOB is editor numero uno at Urban Papyrus. Music, every kind of TV, Movies, fancy tech and everyday news are some of the things he loves (along with referring to himself in the third person). Report: Google has been paying Apple a fortune to be Safari’s default search! Copyright © 2019 Urban Papyrus, All Rights Reserved.